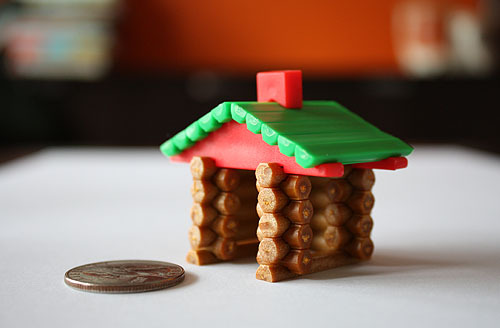 Seattle got snow last night and though we don’t have cabin fever yet I thought it was a great time to open my latest impulse purchase, itty bitty Lincoln Logs. I found these at the drugstore and they came as a set of four canisters meant as party favors, each one holding the bits needed to make one teensy weensy log cabin. That there is a quarter in the picture for some scale. I was hoping to take one outside and put it on a little mound of snow to grab a picture, but the slightest movements caused the cabin to fall apart. I’m going to open all the canisters and see if I can build a really tall mini Lincoln Log tower to knock down. Where did you buy those? They’re fabulous! You have got to be kidding me! Way better than crayons to entertain the kids at a restaurant. That is awesome and it is too bad that it wasn’t structurally sound enough to move. That is so cool! I want to be your friend. I love this new daily picture thing you are doing! Siew – I found them at a local drugstore called Bartell’s. They were, oddly, near the baby shampoo. that’s adorable! I’d totally buy one if I came across it in a store. at first I thought those were tootsie rolls- they have the same sheen! I also love your daily pictures!! I saw these somewhere – I think it was a Bed, Bath & Beyond for some reason. I was really tempted to buy them and the mini barrel of monkeys, but I was already spending too much money, so I didn’t. Now I wish I had! It’s nice to see what they actually look like.